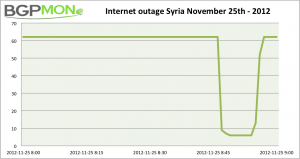 Our historical data shows that Syria had an outage of similar scale earlier this week on November 25th at 08:46 when it lost the same number of prefixes for ~10minutes. This might have been a test run, or perhaps more likely indicate that the outage is the result of damage to the physical infrastructure( optical fiber, radio links, routers, data centres, power) that makes the Internet work in Syria . Update Fri 30 Nov 2012 02:15 UTC The last 5 remaining Syrian prefixes originated by TATA are down as of 23:45 UTC. Syria is now 100% offline! Brief sign of life There was a brief sign of life from the Syrian prefixes announced by TATA (AS6453). BGP updates for these prefixes were briefly seen between 15:50 and 15:52 as well as between 17:39 and 17:43, UTC times on November 30th. A brief restoration of power could be one reason for this short sign of life. Back Online (Dec 1st, 14:32) Internet connectivity to Syria has been returned and all Syrian prefixes are now back online. Connectivity was restored at 14:32 UTC (Dec 1st) via AS3491 PCCW Global, AS6453 Tata and AS6762 telecom Italia. About 1,5 hours later at 15:58 Syria’s connection with Turk Telecom was also re-established. please help me to understand this. First you say there is AS29256 (The Syrian Telecommunications Establishment) and then you mention the three other AS. So four AS went down or were the other three routed through AS29256? I am not sure about what role which provider supplies. Also, Telecomix reported all GSM went down. Syrian Telecommunications Establishment (AS29256 & AS29386) are connected to the rest of the world via these other transit providers. The connection between the Syrian Telecommunications Establishment and its transit providers was lost. Causing Syria to go offline. With regards to BGP withdrawals for Syrian prefixes, these can be caused by any router on the internet, due to issues at the originator of the network or local events. If however many different routers on the Internet see a withdrawal for a given prefix at the same time it’s fair to assume the root cause of the withdrawals lies at the originator of the prefix. We can’t say what the root cause of the outage is, power outage, fiber cuts, links shutdown or administrative shutdown will all result in BGP withdrawals.